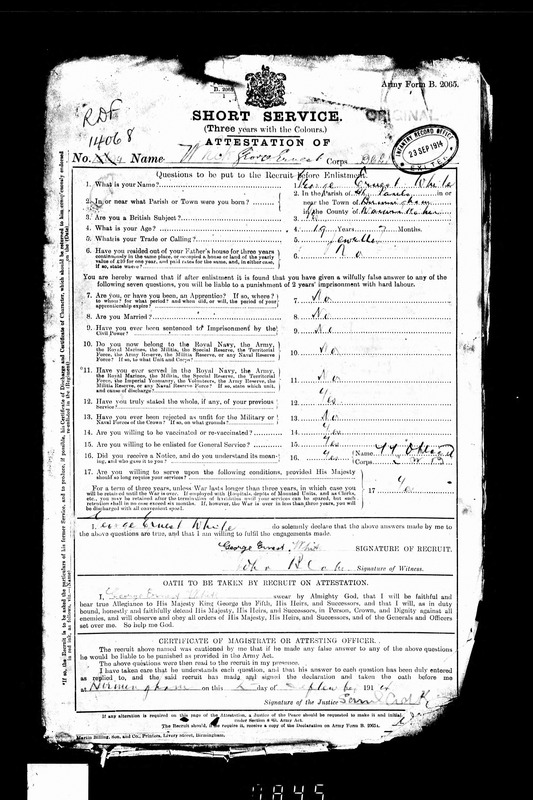 With the 100th anniversary of The Great War being commemorated all around the country, if not the World, it was amazing to find my Grandfather’s sign-up papers recently. George Ernest White, my mother’s father, joined the Duke of Cornwall’s Light Infantry regiment on 2nd of September 1914. His enrolment marked the start of a European wide and terrifying journey. My maternal grandfather died of tuberculosis shortly after I was born, so although we met, I have no recollection of him. He was a respected jeweller, working in the jewellery quarter in Birmingham from the early 1900’s. Although he survived WWI, he did not come out of the conflict unscathed, being gassed, shot and shelled during his time in Gallipoli, Egypt and France. He was also a machine gunner, the most hated of all roles. Soldiers on both sides of the trenches, performing this role were shot if caught, so devastating was the trail of death they left behind them. It is difficult to condone the actions of our ancestors, living as we do in an era of comparative peace, but I imagine they did what they were told and had little or no choice in the roles they were given during their service. I feel no pride for what my grandfather did, nor do I condemn him for his actions. Many lives were lost during the conflicts of the first and second world wars, and what should be condemned, is that those lives were lost largely in vain. We have truly not learned the lessons of human conflict. I am hoping to discover more about George Ernest’s exploits during the 1914-18 campaigns. We have snippets of his history, but it will be very enlightening to follow his progress through the geography and battles that left so many lying in war cemeteries all over the Europe. The sudden and tragic passing of a local chap, due to a motoring accident, led me to think about how fragile life is, and how we often take it for granted. It also prompted me to find this well known poem about death, from the Buddhist perspective. Though we may relinquish our body in this lifetime, we are not gone, nor will we ever be. So laugh with me, hold my hand, let us say good-bye, say good-bye, to meet again soon. Often we hear about the different attitudes of religious doctrine around the world, some we are happy to embrace, others we find unsettling. But whatever the doctrine, religion must teach us an ‘attitude to life’. To live a life of true human dignity is certainly difficult. Life is change, it is continuous change. Nothing is constant. The four sufferings of birth, old age, sickness and death are an eternal theme that no one can escape. Amid harsh reality, people yearn from the depths of their beings, to live with dignity, for their lives to have meaning, and they make efforts towards that end. The product of these human yearnings, these prayers, is religion. Religion was born from prayer. What is Nichiren’s response to these prayers of human beings? What attitude towards life does he teach? The answer, in short, is the principle of attaining Buddhahood in this lifetime through continued practice. Today is one of those days that none of us look forward to, because as I post this, it is exactly twelve years, almost to the minute, since my Dad passed on. The day is made all the more strange, because the 27th of September had always been a special day, it was also his mother’s, my Nan’s, birthday. Just another one of those coincidences that life turns up occasionally. On that day, 12 years ago, we knew that Dad wasn’t well. He’d suffered from Angina since his early sixties, but that was under control, as were his cholesterol levels. But he had had a silly little accident, dropped a heavy wooden box on his shin, and the resulting wound refused to heal. Because he was forced to rest the leg, he stopped going out for walks and could usually be found sitting reading, or sleeping, in his chair in the lounge. He started to put on a bit of weight and whenever he did venture out, would have to stop occasionally to draw breath. But that wasn’t really why he was in hospital that day. He had gone, the day before, to have some routine tests. During the tests they noticed that he had a rather swollen belly, and asked him a bit about it. It turned out that he had been having a bit of trouble with his ‘plumbing’ and actually had a very distended bladder. They used ultrasound to take a look inside, and decided that they should drain it using a catheter. Now my Dad was a rather private and quite shy man, always kept himself to himself, and would have been most uncomfortable with this procedure. Not only that, but he was never one for staying away from home, even if it meant driving long hours to be in his own bed that night. So when they told him that he had to remain in the hospital overnight, just as a precaution, so they could keep their eye on him, he would have been put under further stress. Whether it was as a result of this stress, or maybe the fact that having been drained of five litres of urine allowed his organs to settle into unfamiliar positions, we will never know, but that evening he had his first heart attack. The medical staff made him comfortable and although it was worrying, when my Mom rang to tell us, we all felt he was in exactly the right place to be looked after and to recover. We talked about coming up to see him at the weekend and left it at that. I don’t think I had even mentioned the new Jaguar I had picked up that day, but I was looking forward to showing Dad the car, he always loved Jags, though he’d never owned one. But driving to work the next morning, I was unaware that everything was going to change that day. My mobile rang at about 9:30am, I was in the office, suited and booted as usual, it was my Mom. She was clearly upset, and told me that Dad had had a second, more serious heart attack a couple of hours earlier, and that I should come up to Sutton if I could. It’s a journey of about 100 miles, and I set off at once. You can do an awful lot of thinking during a journey of that length. I wasn’t chanting back then, though I was a practicing Buddhist. Even the journey was strange. To start with, I was driving this brand new car, all shiny and bright, and trying to get there as fast as possible whilst still trying to break it in gently. As I came off the M42 at Curdworth, I decided to take the back road to Bassetts Pole and come into Sutton from the North, to avoid any congestion. Big mistake, it was the Ryder Cup, being played at The Belfry, and I drove straight into all the hullaballoo. A very nice Policewoman stopped me at a checkpoint. Understandably, wearing a sharp suit and driving a brand new Jag, she mistook me for one of the players, or an official, definitely somebody connected to the golf. I explained the situation, that I was rushing to get to the hospital, that my Dad was very ill, she asked me to wait. I was sandwiched between two pairs of Police motorcycles and we set off at pace. The two riders in front went ahead to clear the route, stop the traffic at islands, lights etc. while the two at the rear leapfrogged at each junction and went ahead to continue the process. I have never driven so fast on a public road, they were amazing, and we reached the hospital in double quick time. One officer took my keys and told me to go to find my Dad while he parked the car. After it was all over, I wrote a letter to the Chief Constable, thanking them for their help. I rushed to Intensive Care, where I found Mom sitting in an ante-room. She was looking very worried, but was pleased to see me, we talked about what was happening. Then a doctor came in, asked us to sit down, and gave us an update. I asked whether I could go and see my Dad, I had a heavy cold and didn’t want to make things worse. The doctor explained that I couldn’t make it any worse and ushered me into the room. My Dad was covered in wires and pipes. A respirator, heart monitor and all manner of machines were gathered around the bed. He was unconscious, and the nurse explained that he had been sedated to stop him from suffering any pain. We sat with him for a while, just watching his chest moving up and down as the machine kept him breathing. The nurse asked us to go back to the ante-room and told us that the doctor would be in to talk to us shortly. When it came, the doctor’s message was short and to the point, and although he spoke very quietly and calmly, there was no easy way to say it. My Dad was being kept alive by the machines, the damage to his heart was too severe for him to recover, and they asked us whether they could turn the machines off. I don’t really remember what was said, but they went away to turn off the apparatus, to remove the wires and pipes and to clean Dad up a little. We just sat and waited. When they were ready, we went back into the room, the machines were gone and Dad was lying motionless on the bed. I say it was Dad. But actually I remember thinking it looked like a waxwork model of him. The total absence of life had changed everything. It looked like my Dad, but it wasn’t my Dad, something very essential was missing. We took a little while to say our goodbyes, the staff were very kind and looked after us, but their jobs were done. I don’t remember whether I cried, I don’t remember Mom crying, we just looked after each other. I do remember walking down a long, long corridor towards the hospital entrance. There were people laughing, whistling, running about. Life was going on as usual. But my Dad had just died, what were they thinking? But slowly the truth becomes clear. We are all part of the Universe, all connected through the universal life-force, and when we die, the Universe continues, life continues, the Wheel of Life continues to roll inexorably on. So September the 27th is a day I hate to remember, but it is a day I shall never forget. My Buddhist faith has put a different slant on the events of that day. I know that my Dad is back, somewhere, leading his new life. Knowing that takes some of the pain of losing him away, and for that I am very grateful. I love you and still miss you Dad, it’s a pity you never got to see the Jaguar. It’s a fairly well known fact that 90% of the wealth of the UK is in the hands of 10% of the population, which is a shocking state of affairs in my opinion. Of course it’s fairly easy to be shocked when you aren’t one of the 10%, but it got me wondering whether I would be any more benevolent if I were. You may remember the fable about the rich farmer who, having grown his crops, decided that he needed to store it somewhere safe, so that the peasants of the area couldn’t get their thieving hands on any of it. So he set about building a huge barn, and made it secure so it kept out the riff-raff. It must have taken him quite a while to build it, but finally it was finished, and he was happy that his crops would now be safe. Of course, there was far more than he would ever need himself, but he locked it all away and hoarded it for his old age. Ironically, the night the barn was finished, he died in his sleep. So the adage that ‘you can’t take it with you’ is anything but new. So I suppose the lesson from the story is, if you have enough of anything, money, food, whatever, you are fortunate. If you have more than enough, you are more than fortunate, and you might consider sharing some of it with others less fortunate, particularly in these austere times. Behind our office in Ringwood, runs the Bickley Mill stream, a small tributary of the river Avon. In winter it can be quite a torrent, but since the recent dry spell, it has slowed to little more than a trickle, and for a couple of minutes today, I stood watching the water flowing slowly past. I have always found water fascinating. The conjunction of reflected and refracted images mean that there is a merging of environments. It is not possible to see the bottom of the stream clearly and yet you are offered glimpses of clarity as the water ripples produce the perfect angle to see through the surface. An instant later that view is gone. I can see a similarity between this phenomena and our lives. You may have experienced times when you have a sudden flash of clarity, regarding a problem or opportunity, then moments later it is gone, cloaked by the smokescreen of everyday life. I know that I have woken from a particularly vivid dream, where the memories are so clear that it has taken a second or two to realise that it was a dream. Almost as soon as that realisation kicks in, the memories start fading, so quickly that within minutes it would be quite difficult to relate the dream to someone else in all its detail. Another thought popped into my head. The flow of the river, the flow of time and the passage of our lives are all one and the same. Specialist subject ‘stating the obvious’ you might be saying, but it was one of those clarity moments which almost takes ones breath away. I think we should all take a second to remember, that moment by moment, our lives are moving like the river, from future, to present, to past, in an unstoppable flow. Wishing for the weekend to be here, waiting for that special event, all miss the immediate imperative, that every second is precious and should be used to the full. Nobody knows when their time will be up, when they have no more future, only past. That, in my opinion is a good thing, imagine the sense of panic that would be induced by seeing that ‘life clock’ ticking down to 00:00:00. What is important is to use your time wisely and never, ever, waste a single second. Another call by leading doctors and academics, to scrap the proposed increase in the use of statins, has been heard today. With NICE, the National Institute for Heath and Care Excellence, proposing to put millions more people on statins to lower their cholesterol levels, are we seeing yet another pharmaceutical led scam of the general population? This advice comes despite figures for deaths from heart attacks and strokes showing a decrease over the past few years. In fact, dissent from certain quarters is already pointing out that the side-effects from taking statins can often outweigh the benefits. But surely they are completely missing the point here. The ‘Western Diseases’, heart attack, stroke, cancer, Alzheimer’s disease and increasing obesity cannot be prevented or treated by statins. The cause of all these illnesses is entirely down to the western diet, and predominantly the massive consumption of meat and dairy products. People will say, in defence of their lifestyle, that man has eaten meat and dairy for centuries, which of course is true. However, the rapid rise in the level of consumption, allied to the increase in average life-span caused by advances in medicine means that heart disease is fast becoming the number one cause of death in the west. So rather than prescribing statins, and then other drugs to deal with the side-effects that they cause, we should all be concentrating on our diet and taking more exercise, prevention rather than cure. Of course, the pharmaceutical companies don’t want us to do that, they can’t make billions from healthy people. As always, in our Utopian capitalist society, ‘they’ are trying to make money by keeping the general public unhealthy and ill-informed. If your doctor suggests that you start taking statins, politely decline and instead take a good look at your lifestyle to see how you can change it to prevent these problems long before you need a cure. For more incentive to make that change, you might want to watch this informative video. Today would have been my Dad’s 88th birthday. In later years, he had a passion for free pistol shooting, he kept meticulous sets of figures of his scores, and used to compile the tables of scores for the club to which he belonged. He was very angry when the Government brought in stricter gun laws, and he was unable to keep his much cherished guns. He always felt that they were punishing the innocent for the sins of the guilty.